Opponents of the Venezuelan government have promised to continue street protests aimed at forcing out President Nicolas Maduro. The opposition warning came a day after at least two people were killed and hundreds arrested in Venezuela’s largest anti-government demonstrations in years. Thousands of Venezuelans filled the main streets of the capital, Caracas, on Wednesday. Many demonstrated in support of the president. Many others protested against Maduro and socialist policies. Security forces armed with tear gas were deployed in a neighborhood on the west side of Caracas. One teenager shot in the head near an anti-government protest died while doctors operated on him. Pro-government militias were blamed for his death, as well as the killing of a woman in the city of San Cristobal. Venezuelan officials are investigating the events leading up to both deaths. A National Guard soldier was reported killed during protests in Miranda state, near Caracas. At least eight people have been killed since the political unrest started three weeks ago. Wednesday’s protest fell on an important date for Venezuelans. On April 19, 1810, Venezuelans began their drive for independence from Spain. In Washington, United States officials are worried the Venezuelan government is working to suppress the opposition. Tillerson spoke at the State Department on Wednesday. In recent protests, security forces have fired rubber bullets, tear gas and water cannons. The demonstrations began after a Venezuelan Supreme Court ruling on March 30. The court said it would take away the legislative powers of the opposition-controlled National Assembly. However, the court overturned its position after national and international criticism about an attempt to seize power. Venezuelan opposition leader and Governor of Miranda state Henrique Capriles gestures while rallying against Venezuela's President Nicolas Maduro in Caracas, April 20, 2017. 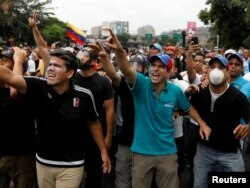 Maduro's opponents gathered in Caracas on Wednesday to pressure his administration to respect the assembly's autonomy. They also want the government to hold long-delayed elections, free political prisoners and restore other democratic customs. The National Socialist Party has ruled Venezuela for 17 years. Economic pressures have grown in recent years. The price of oil, Venezuela's chief export, began falling in 2014. Venezuelans also face severe shortages of food, medicine and basic goods. In related news, the American car manufacturer General Motors has stopped doing business in Venezuela after the government took control of its only factory in the country. Alvaro Algarra wrote this story for VOA News.com with contributions from Nike Ching. Jonathan Evans adapted the report for Learning English. George Grow was the editor.